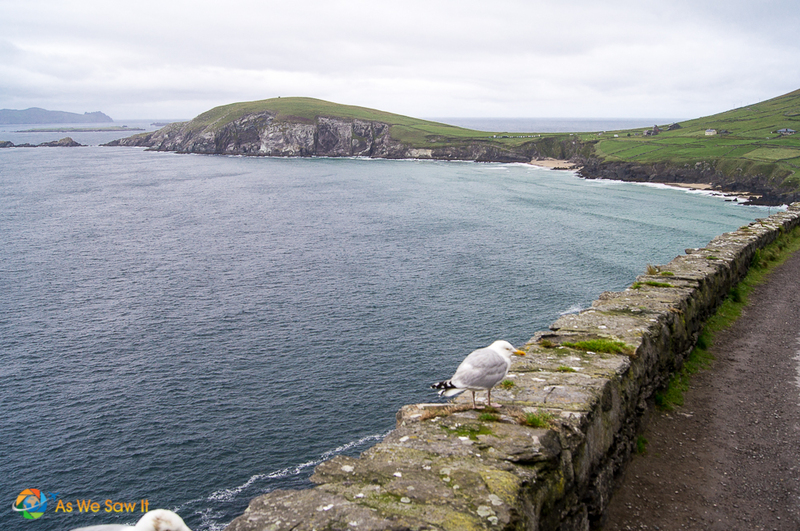 Blame travel guru Rick Steves for first recommending the scenic Slea Head Drive route. 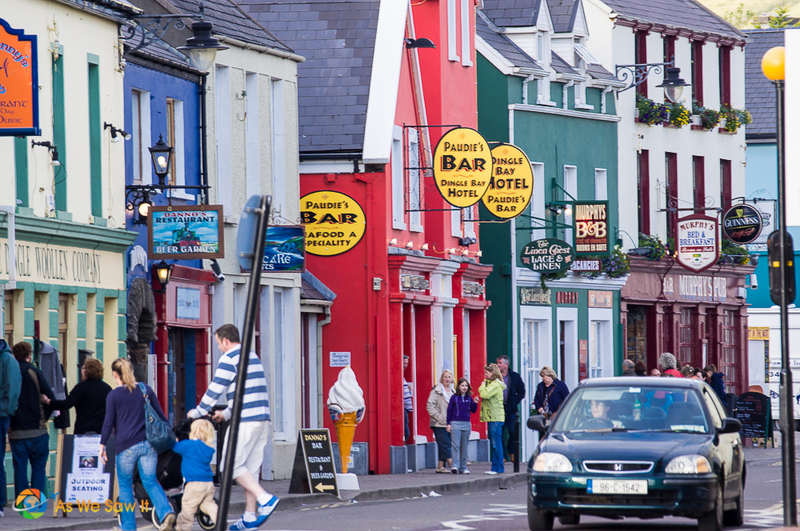 He said Ireland's Dingle peninsula would be “more Irish” and less touristic than the Ring of Kerry, and that the drive would be one of the best things to do in Dingle. Even without having been on the Ring, I suspect he might be right. 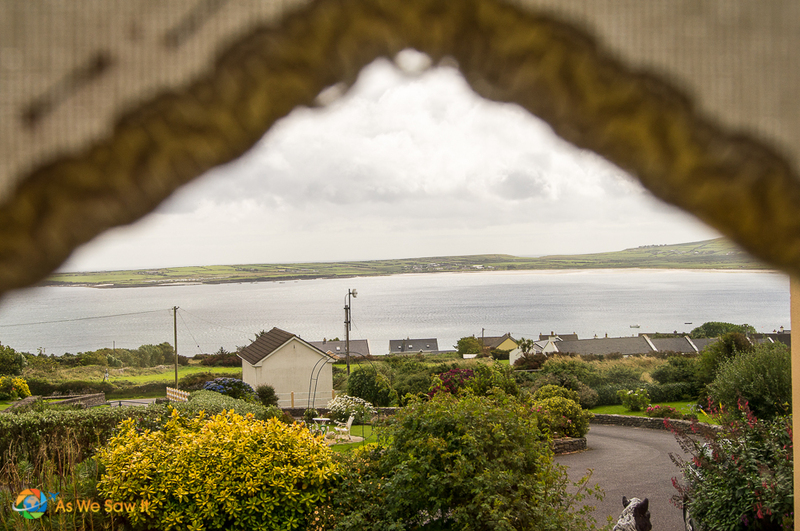 In any case, staying in a small, family-run bed-and-breakfast outside of Dingle certainly feels Irish. Ventry isn't cut out for tourists. It has just one restaurant and one pub. Plus, unlike its larger, more touristed neighbor, most of its residents still speak Gaelic. That's fine with our son. Jimmy brags about his Irish heritage. I'm sure this will be a memorable experience for him. Music generally starts between 9 and 10 pm. 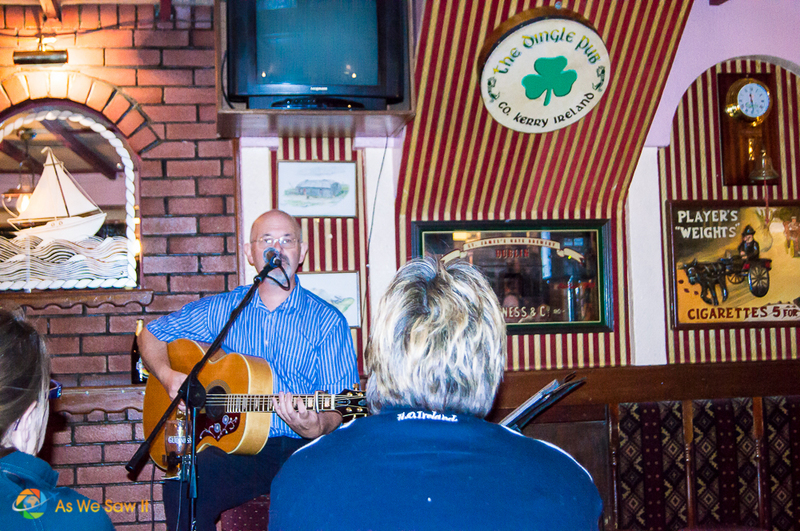 We went into three establishments after we ate, and each had its own traditional duet. One pub had guitar accompanied by Irish bagpipes, a second had a guitar plus banjo, and the last had a guitar and accordion. All were different, yet each had a very traditional (“trad”) sound. Alas, each stay brief, as no seats were to be had. Overcast skies and the promise of rain meet us the next morning, but we're not the type to let weather deter us. Driving the scenic Slea Head coastal road, even on a cold, wet, and windy day, is why we came to the Dingle peninsula in the first place. We brave the dismal weather and leave our car to explore a few ancient beehive huts. These rustic, rocky igloos were inhabited until 1200. Elsewhere, sheep are penned in by mossy rock walls that have been there for centuries. Off in the misty distance, the stone walls of abandoned houses stand, silent monuments to those forced to leave their land during the Irish potato famine. 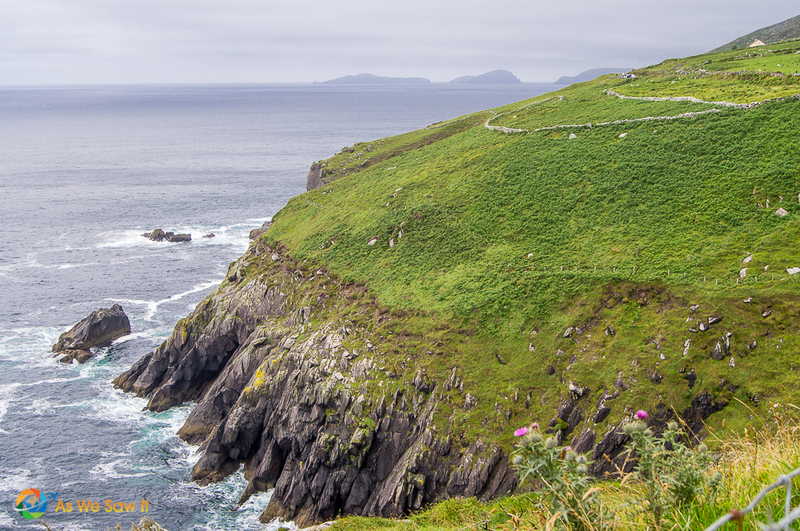 Slea Head Drive twists and turns along a picturesque coastline, offering stunning views all along the way. The narrow, winding road challenges us to pull off for a photograph, and we accept. Only a few feet from our car, dramatic cliffs plummet to meet the clear, blue Atlantic waters. We hear waves crash against the rocks at their feet while the now-abandoned Blasket Islands rise from the sea. These are the panoramic vistas that photographers and painters covet. Further west we drive, and more and more signs are in Gaelic only. We laugh at our blundering attempts to pronounce the Irish words and names, not realizing that Slí Cheann Sléibhe meant nothing more than Slea Head Drive. Spellings can be deceptive. English is hard to read, let alone pronounce. Never mind through vs tough; our ph makes a “f” sound, and an x in an English word might as well be “ks” or “z”. The Irish language is little better. In Ireland, County Laois is pronounced “leash.” The name Siobhan? Sho-van. And you'd think the scenic drive we are on, Slea, should rhyme with “flea”, but no, it’s like the word “slay” or the name Shea. Or sleigh. So … Sleigh Head, Ireland. Why not? We tire of the game just as a little shop appears in the distance, steps from a beach. It must do a brisk business in warmer weather. Lunchtime arrives farther along a back road, where no English can be heard nor seen. Neither can any buildings. Nearly despairing, we drive for miles before finally finding a local pub. Our only welcome is the sound of the radio behind the counter, set to a Gaelic station. Finally, the proprietor emerges from the back. Thank goodness he speaks English, but we soon learn that only two items are on the menu: soup or sandwich. We are hungry enough to order both, plus “a pint” to warm us up. 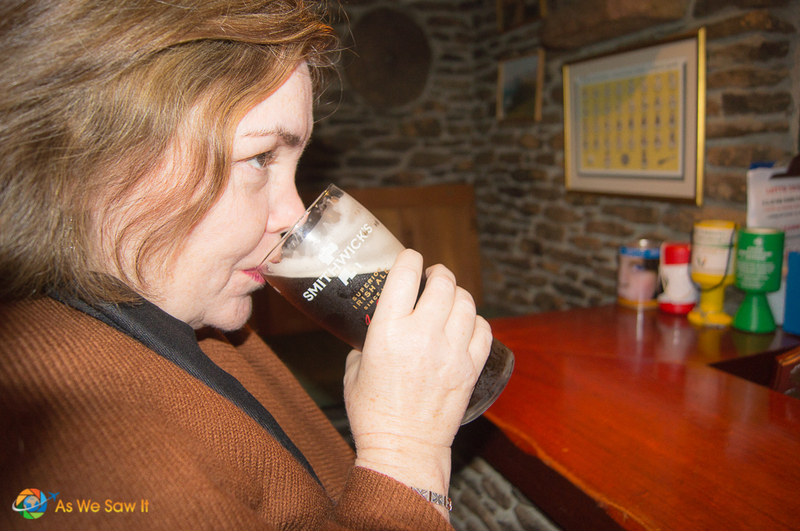 In Ireland, a nip of any kind of alcohol hits the spot when it's cold and rainy. This miserable weather has brought us to order a pint whenever possible. Yes, this will do nicely. 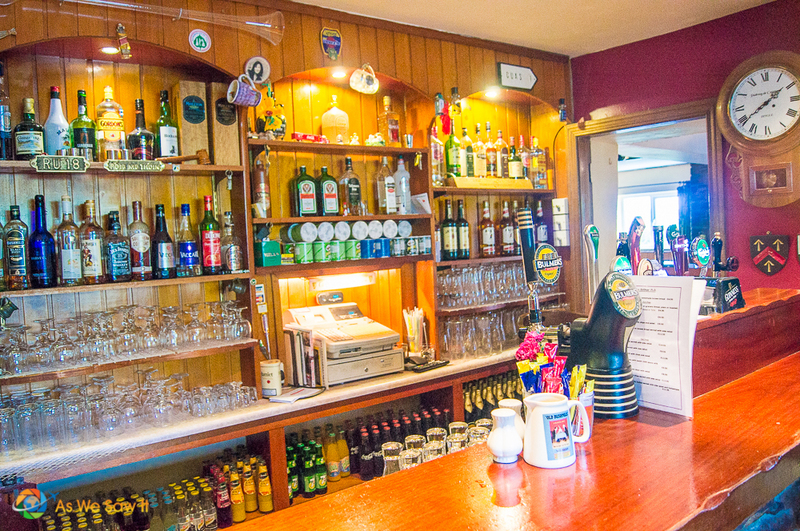 Tip: In Ireland, Bulmer's Cider and Smithwick's Ale are on draft everywhere. Bulmer's is a nice change from savory hops and quite unlike American ciders. About as alcoholic as beer (4.5%), it is crisp and dry. As to the ale, Irish beers aren't served ice cold like they are in the U.S., but the cool basement temps perfectly enhance their flavor. Slea Head Drive circles back to end in Dingle, conveniently just as the weather clears. Perfect timing. We have plenty of time before dinner to walk along the waterfront and along some of the streets, so we set off to see what we can find. 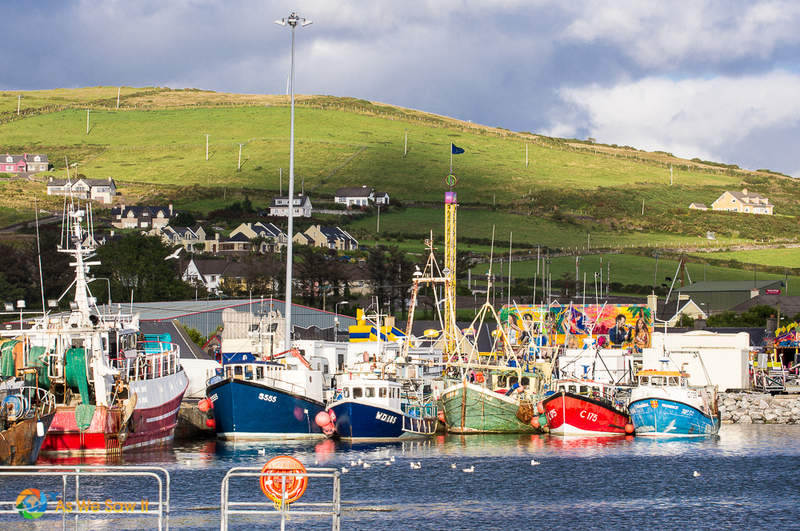 It doesn't take us long to fill our cameras with beautiful photos of Dingle. Finally, our day ends in a waterside family restaurant in downtown Dingle. After last night's fiasco, we eat early and immediately set off to find early seating. It still takes us a while to find a pub with seating for three cold, wet tourists. I'm not sure if it is the damp weather, the cozy pub, or the talented performer, but within minutes after finding our seats, it's standing room only. 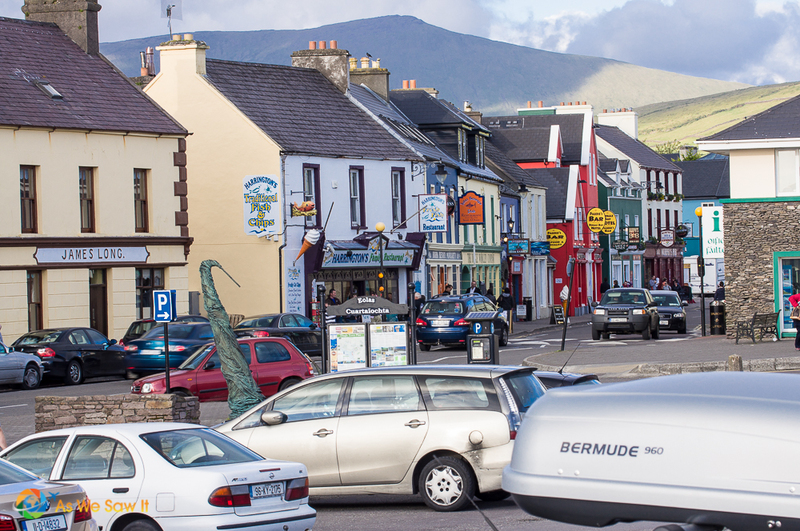 Find the Dingle tourist office at The Quay, Dingle. Open Mon-Sat, 9:00-17:00. (Email: dingletio@failteireland.ie, Tel. +353 66 9151188). 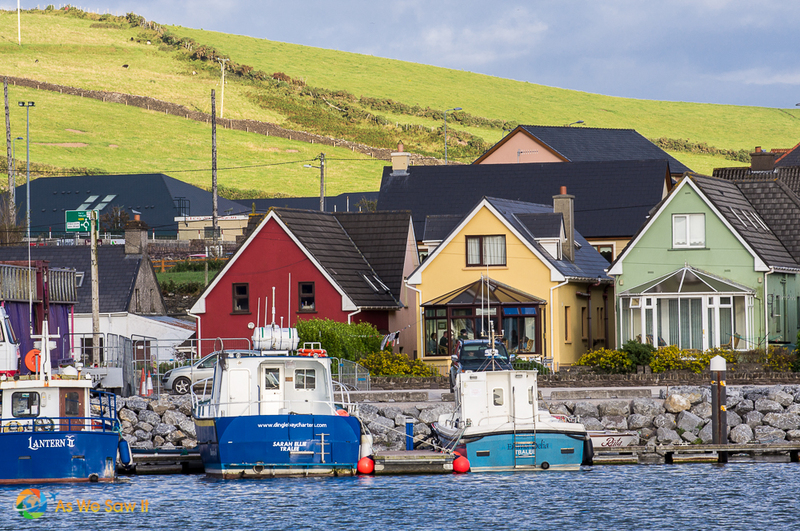 Dingle-peninsula.ie is another good resource. 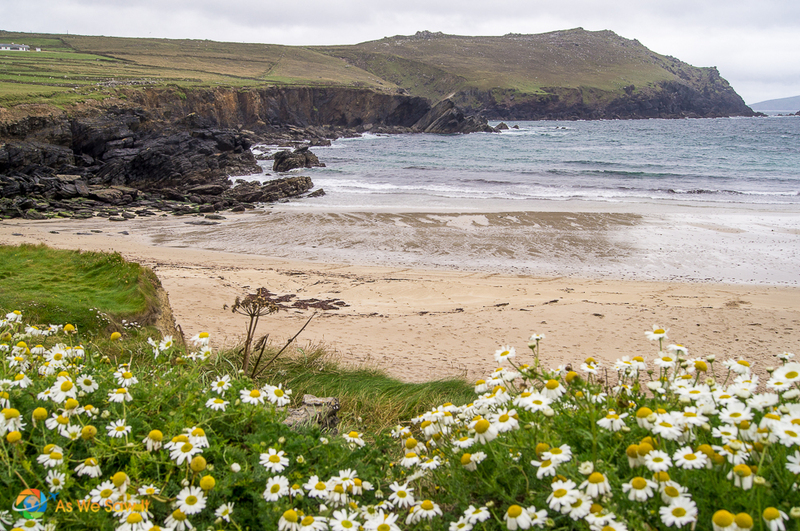 See more of town and Slea Head Drive at our Dingle Peninsula photo gallery. 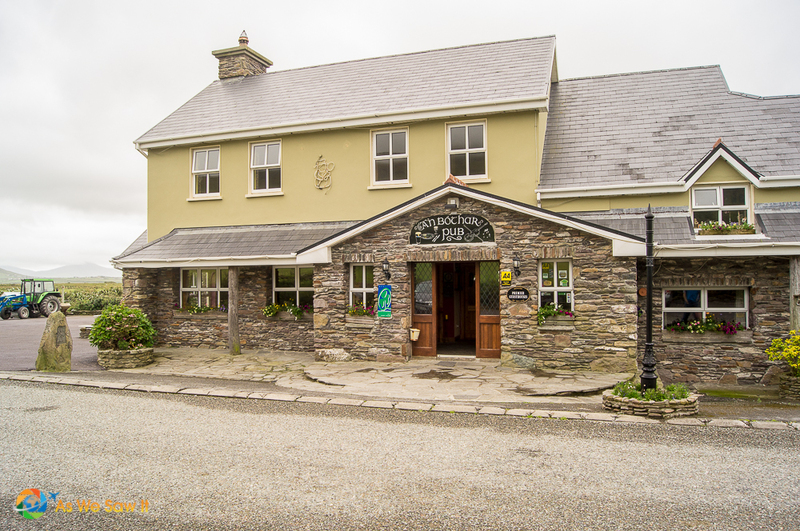 The Plough Bed and Breakfast in Ventry, Ireland. Tip: If you enjoy road trips, read World’s Best Scenic Drive: the Causeway Coastal Route. Our itinerary lets you see Giant's Causeway and tour Northern Ireland in less than a week. Is Blarney Castle Worth the Hype, or a Bit o’ Blarney Itself?